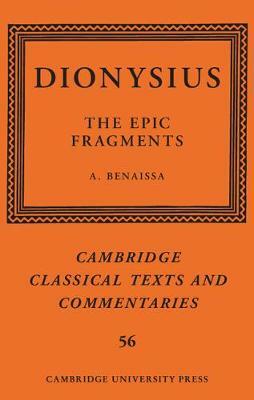 The epic poet Dionysius, who probably flourished in the first century CE, is a key transitional figure in the history of Greek poetry, sharing stylistic and thematic tendencies with both the learned Hellenistic tradition and the monumental epic poetry of the later Roman period. His Bassarica is the earliest known poem on the conquest of India by the god Dionysus and was an important model of Nonnus' Dionysiaca. His Gigantias related the battle of the giants against the Olympian gods and legends surrounding it, with particular focus on the figure of Heracles. This is the most comprehensive edition to date of his poetry, expanding the number of fragments available and providing a more reliable text based on a fresh inspection of the papyri. The volume includes a substantial introduction contextualising the poetry, a facing English translation of the text, and a detailed linguistic and literary commentary.